When talking about summer sports it’s often about the benefits of taking a break from hockey and how other activities can help build players into better athletes overall. But if you’re looking to work on a specific area of your game, we’ve switched up the conversation and broken down what areas of hockey you can improve by playing other sports. When kids specialize early in one sport they miss out on important skills and many get injured, burnout, or quit. That’s why top athletes and sports experts say the same thing: let kids play as many sports as possible. Playing other sports gives a different perspective than hockey and can teach other body movements to build a stronger overall athlete. It also gives another opportunity to meet a new group of people and teammates and try something new. Understanding the benefits of spacing can help develop offensive opportunities. You need to work to get open for a shot. Basketball has a very similar up-and-down the court flow to hockey and all players are responsible on both offence and defence. There is also the concept of playing man or zone defence. Perhaps the most striking similarity is the 5-on-5 gameplay, the same amount of players per side as in hockey. Spacing is very important in many sports and soccer is no different. With feet being the main point of contact for ball movement, soccer requires a different muscle coordination than hockey. Soccer can boost a player’s speed and leg power. 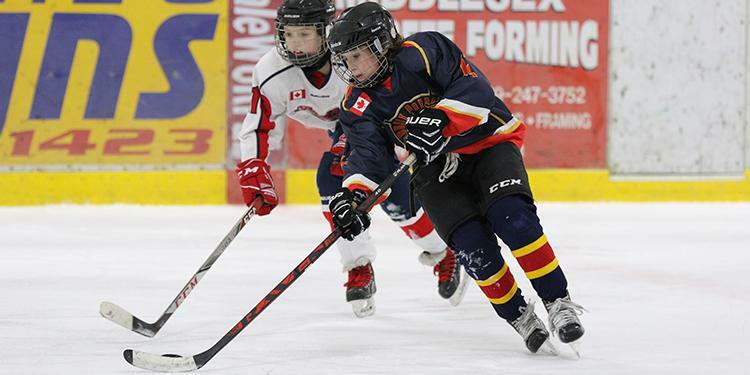 The footwork required can help players become craftier on the ice. Cycling the ball back to the defence for a reset mimics what can happen on the ice. Just because the ball isn’t moving forward doesn’t mean the offence isn’t working – using the whole area of the pitch can keep defences on their toes. Keeping your head up to read the ice is a point of emphasis in hockey. If you’re looking down at the puck it’s harder to see where your teammates are or where a scoring opportunity can develop. Soccer and basketball offer similar concepts for reading the play around you while executing a constant dribbling motion. Tennis and baseball focus more on building up accuracy through contact. Swimming is a great activity that uses a lot of different muscles and movements. It is also a fun way to stay cool while being outside. Whether working on technique and laps or simple free play, the added resistance of moving in the water is beneficial in building strength. Make sure you have permission and supervision before going into any water. Hopping on a bike is a great way to exercise while spending time outdoors. Ever feel the burn in your legs after biking up a hill or against resistance? That’s your leg muscles going to work. Biking builds leg strength which can translate to getting the most out of each stride on the ice. There is balance involved in biking as well to stay upright. Like in hockey, be sure to wear a helmet and avoid any restricted or dangerous areas. On the ice players are required to make quick decisions based on how scenarios are playing out. That is no different in other sports. Hockey IQ ties into seeing the ice and the awareness of the play around you. Basketball and soccer force players to read defences and look for high efficiency shots. Communication is key between teammates. In baseball, basic rules like knowing how many outs there are or what runners are on base all factor into decision making.